Production art prepared for "The Terrible Toys." After a UFO crashes into the ocean, Seaview picks up sailor Sam Burke, who claims his ship was wrecked by the crash of an alien vessel. 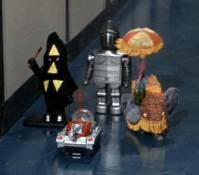 Burke carries only a bag containing six mechanical toys (a robot, tank, parrot, knight, executioner and drummer). It's not long before these toys attack Kowalski, Nelson and Seaview itself. Because of their diminutive size, the toys are able to play an effective game of hide and seek with the crew, hiding in access passages, inside equipment racks, etc. Seaview is soon drawn toward the UFO (above right) by a force ray, while being sabotaged from within by the toys -- apparently under alien control. The longer the alien ray pulls on the sub, the greater the strain on her engines -- it may not be long before they give out. Nelson, accompanied by Burke, uses the Flying Sub as a decoy against the invaders. 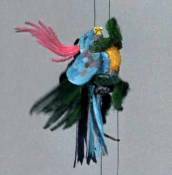 One of the toys has sneaked aboard FS-1 and soon cuts a pivotal control cable so that Nelson too is caught by one of their control beams. 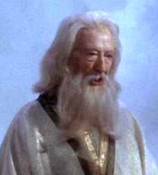 The Flying Sub is reeled inside the alien ship and Nelson told by an ancient looking man that all the visitors want is to replace their contaminated nuclear fuel so they can be on their way again. 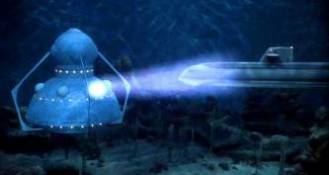 In reality, the aliens want the titanium Seaview is constructed of and are willing to sacrifice her crew to that end. Back aboard Seaview, Burke is exposed as being (albeit forcibly) in cahoots with the aliens and is therefore thrown in the brig. Crane develops a plan to break away from the alien ship by firing the forward torpedoes (for the kickback.) His plans are thwarted by the Toys, who disable the torpedo firing controls. 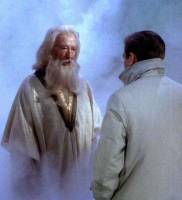 Nelson comes up with a plan to heat the alien craft (they like it cold) with a super-duper heat pack he conjures up in the lab. 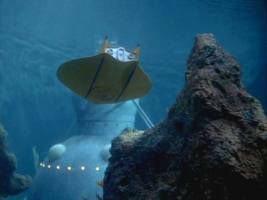 Crane dons scuba gear and heads outside and after a struggle, plants the device on the alien craft while Nelson keeps Seaview at a safe distance. The device is activated and the alien ship vanishes. Sam Burke helps Nelson and company destroy the remaining toys. 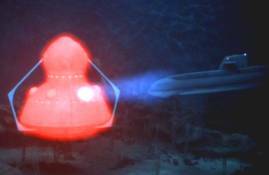 Heated by Nelson's device, the alien ship glows red and vanishes into thin sea water. Francis X. Bushman as alien. Trivia: Francis X. Bushman was a famous screen idol during the 1920s. His career declined during the start of the talkies, in part because his butler had accidentally insulted a movie mogul during a Hollywood party. 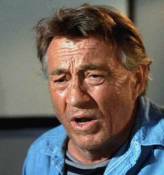 Bushman died from injuries suffered in a fall only three weeks after filming this episode. Mark Says: This is the first episode where the weekly menace is way over the top � malevolent department store toys. Holy retail sale! Some of the engineering and rigging involved in making the toys move (especially the parrot) is kind of interesting and the underwater photography and alien ship look cool. However, it�s a very juvenile and noisy episode and the tug-of-war between Seaviewers and toys gets tiring. Mike Says: This is the first of a kajillion episodes in season three to start with a UFO being sighted, tracked, or crashing into the ocean. It is interesting that Justus Addis did a very reasonable job of directing Werewolf and then turned in weaker efforts with "Night Of Terror" and this episode. As Mark points out, the mechanical rigging was ingenious in places, but the direction and pace were flaccid. The "science" in this episode is particularly suspect, especially the assumption that torpedo recoil could push Seaview away from the enemy craft. Come on now! On the other hand, the miniatures were great and at least this wasn't another MAN IN A RUBBER SUIT episode, plus the music is very good. The show has eerie moments (the scene with Nelson inside the alien ship (at right) is nicely staged), and although it's not my favorite year-three outing, I certainly don't despise "The Terrible Toys."